1) Doesn't MX comeback make part of his scheme in BBS kinda irrelevant? One of the main reasons he possessed Terra was because he wanted a new, younger body since he was old and he wanted to see a Keyblade War happen before his death. And now that MX is back in his old body, dying of old age is possibility (I mean it's never going to happen but still), which was what he was trying to prevent. Unless he tries to find another vessel like he did with Terra in KH3. Maybe the whole heart splitting thing is like Horcruxes, in which you split your soul and live forever, and only die once they're destroyed? I don't really know if this is clear or not. 2) Why doesn't Apprentice Xehanort come back instead of MX? He was the Somebody that turned into Xemnas and Ansem. If he was a fusion of MX's and Terra's heart (I think), and it had Terra's body, I would think that meant that it would be AX that would return, not the old body that he basically threw away and replaced with a new one. And why wasn't AX one of the Seekers of Darkness? Did YX recruit him like he recruited all the other Norts? I mean he seemed to gain his memories back at some point and continue Xehanort's original plan. Sorry if I sound noob-ish, 3D just confuses me sometimes. 2) I would really like to see this one answered as well. You don't sound noobish at all because there's a theory going around that Xehanort participated in the original Keyblade War, and has been switching bodies ever since to survive. Not saying that I believe this theory, but if it were true, then wouldn't Xehanort revert back to his most original state, or rather, his most recent state i.e. Terranort? - would really like some further discussion on point 2. When Heartless and nobody are destroyed the freed parts (heart & body+soul) of the original being are rejoined, not a forced puzzle conglomerate. "Apprentice" Xehanort, or rather Terra-Xehanort, may have been the being that created Ansem SoD and Xemnas, but it is not the original being where Xehanort's heart belongs. Xehanort's heart was forcibly piggybacking in Terra's body, but that makes it in no way actually belonging to this particular body. With the body (Terra's) being cast away Xehanort's main heart has but one place to return to, its actual body which he discarded (but not destroyed) at the end of BBS. To my understanding, Master Xehanort had a feeling that the method of clashing pure darkness with pure light wouldn't work completely, but he wanted to do it anyways for the sake of exhausting that option. Granted, it did work, but due to Ven's intervention, the Xblade became unstable, and it backfired. Hard. He also had set various plans into motion, but with his statement of leaving "seeds", and Braig showing the beginning effects of said seeding. There's a similarity between the Horcruxes and Xehanort's methods. MX seeds his subjects by putting a piece of his heart on them. With the host being willing, the propagation of his heart continues. This process takes years, as evidenced by Xigbar, and how he states his half Xehanort, even though he was seeded since the time Birth by Sleep takes place. We could say that Xehanort kinda lives forever, what with having various hosts with a piece of his heart. With already trying immortality by transferring his heart from his old body, to a new one, what else to try than to try and be immortal in various bodies, thus making it possible to be in various places at the same time? You could say that Xehanort has some resemblances with Sigma from the Megaman X series. Because Apprentice Xehanort was never meant to be a character to have its own persona. There are even subtle hints of Apprentice Xehanort knowing about his past, but I don't think he knew a lot of it. Terranort is basically Apprentice Xehanort, minus the labcoat, and the small facial details that influenced Terra's body. Young Xehanort is also another Apprentice Xehanort, just with shorter hair, and a younger voice. 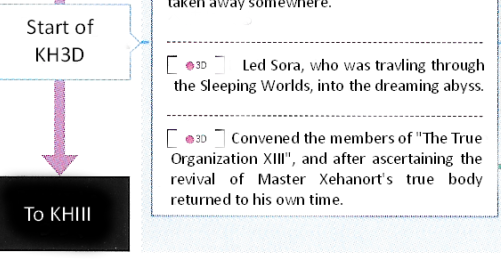 According to Yen Sid, and Master Xehanort himself, in the new secret ending introduced in BbS Final Mix. I don't think Xehanort is from the KHx era, but he certainly knows too much about an era that was lost in history. I think someone was feeding him information. It does beg the question though, where is Terra's body at this point? Is it technically the body that comprises Xemnas, but with some newly generated heart like he describes to Sora, or am I missing something? On that note, I'm assuming that Ansem (Heartless) and Xemnas were just brought there from their respective time periods and not actually revived. But, if that's the case, then it really doesn't make sense that old man Xehanort is the one that regenerates at the end of Dream Drop Distance. But that opens up another problem. Ansem (Heartless) technically only had a body at all because of Riku, which is created at the moment Sora, Donald, and Goofy arrive at the fractured Destiny Islands at the end of the first game (since before then he was just using Riku's body directly), so when did Ansem have time to be whisked away to the future? Sorry, I didn't get around to this game until recently, and none of this makes any sense to me. I mean, to be fair, Xehanort apparently didn't do the split consciously, even less did he necessarily know that defeating his Nobody and Heartless would result in him coming back. Even then, he was either a) arrogant enough to think it would never happen or b) expected Terranort to come back. This is what I am longing to know tbh. Where does Xehanort's body come from when he actually left it behind back in BBS? It's like it materialized itself. And I do wonder whether Xehanort has Terra and what condition he's in. I mean with the First Breath Concert, we know Nomura didn't forget about the Lingering Will and that means part of Terra is still missing from his Body and Heart (and soul?). Without his will, he might actually be a vessel. I mean it makes sense, but fact is like Scatterbrained mentioned, the original body was Terra's after all, that's why Xemnas looks so much like an older Terra with some minor Xehanort features. Xehanort's body was gone for 13 years while Terra's existed in the form of Xemnas. How can it be then that Xehanort returns? His body should have rotten in theory (I mean I suppose KH doesn't work that way lol). Ansem (Heartless) technically only had a body at all because of Riku, which is created at the moment Sora, Donald, and Goofy arrive at the fractured Destiny Islands at the end of the first game (since before then he was just using Riku's body directly), so when did Ansem have time to be whisked away to the future? This is very frustrating. Throughout the series, Ansem SoD is using Riku's body to use his true form except for one occasion. This is in Re:CoM when Diz allows Riku to fight Ansem SoD in a physical state. Which would make sense considering that in Riku's story in La Cite des Cloches, Ansem SoD and Riku reference the events in Re:CoM. Is it technically the body that comprises Xemnas, but with some newly generated heart like he describes to Sora, or am I missing something? * The MX we see in Where Nothing Gathers is actually from the future and decided to come to that specific point in time because it's all part of his grand scheme, in a future where he is Apprentice Xehanort/Terranort. so when did Ansem have time to be whisked away to the future? Plenty. From the point he gains a physical appearance, to before he's destroyed. Ansem doesn't have a body, he's just projecting an image the same way Sora did up until Roxas reunited with him in the start of KH2. This is a stretch, but what if the Master Xehanort we see in DDD is actually either his Nobody, or he's actually from the future? I mean, maybe Xehanort did return as Terranort, but decided to leave Terra's body momentarily for the sake of the heroes seeing him personally. Or maybe Terra is in a stasis the same way some of Ansem's apprentices are. I don't know. At this point in time, Terra's fate is an enigma. That doesn't explain the problem though - Master Xehanort's body has been gone for 13 years and since his heart never succumbed to Darkness by itself (only in conjunction with Terra's), it shouldn't exist anymore. He willingly left it behind and I always assumed that meant it's just... gone. Or did you mean to say he's a Xehanort from the past? I can actually believe that and I've seen a few people propose that idea. That is definitely possible, I just hope they explain it well then (if he really did decide to leave Terra's body for whatever reason, after all, it is a dangerous gamble). No. I meant that Master Xehanort came from the future and traveled back to DDD to the point where the heroes see him on the throne. But the idea of MX being from the past is more plausible. As for Ansem SoD and Xemnas, how exactly they are present is not completely made clear apart from the fact that Young Xehanort served as a "portal" for them using Ansem SoD's borrowed time travel powers. â€” In other words, Ansem and Xemnas were, at the same time, existing in the time and space of KH3D as well as having returned to their true human form after being destroyed? Nomura: Yes, it does turn out that way. However, as I said before, â€˜The World That Never Wasâ€™, where the thirteen all met, is a special space. The mechanics behind how they were all able to exist at the same time is a mystery. From KH1 on, Ansem has returned no matter how many times he has been defeated, perhaps the same sort of thing happened. â€” What about Xemnas and Ansem, essentially they werenâ€™t inside anyone, was it due to circumstances of the worlds of sleep? Nomura: First off, when Young Xehanort made contact with the Brown Robed Figure, that is to say, the Xehanort who called himself Ansem, his abilities were transferred to him. As a result of Master Xehanort tossing his physical body, he was able to exceed time, and this power was carried into the Brown Robed Figure. Thus when Young Xehanort made contact with him, he gained this power. Possessing this power. Young Xehanort functioned as a â€œportalâ€, summoning Xemnas and Ansem each time they appeared. Thatâ€™s why Young Xehanort was there whenever they appeared. Additionally, when Sora and Riku dropped into the worlds of sleep, simultaneously Young Xehanort himself goes into the world of sleep. â€” After generating and before attacking Sora, were Xemnas and Ansem somewhere that exceeded beyond time? Or to say it a little shorter: The exact status of Ansem SoD and Xemnas is currently unknown, but Nomura's answer to the last question in the quote's indicates that they somewhere "beyond time" (aka a place or realm where time doesn't flow/exists). I don't understand though why it would make even less sense of Xehanort returning as a full person during the end of DDD as the time-travel shenanigans of Young Xehanort, Ansem and Xemnas have no influence or importance on the restoration process which, as I explained earlier, brings together all the parts belonging to the existence in question. That existence is Xehanort, as in all parts that are Xehanortâ„¢ and not any stolen/occupied parts that are actually Terraâ„¢ or Eraqusâ„¢. Xehanort regenerates in his original body because that's where his main heart belongs, not in a different body he merely piggybacked in without permission. That is exactly what Xehanort's body did. It simply rematerialized. In BBS the body disappears in sparkles and that's it. It doesn't "die" or wither away or something, it simply goes into stasis somewhere in the Darkness as the body doesn't die just because the heart leaves it. The KH II Ansem Reports actually explain this. "Death" only may occur if the soul and the body are separated. And to directly clarify that as well: No, that doesn't mean Xehanort's old body turned into a Nobody because a Nobody is only created if the heart belonging to the body is lost to Darkness (either succumbing to it itself or being stolen/devoured by a Heartless). In Xehanort's case though, he let his heart leave willingly practically simply stuffing his old body in the fridge for storage. The Lingering Will is only a piece of animated armor powered by left over thoughts/memories/emotions, it doesn't hold any of the three "vital" parts of Terra's existence and the actual whereabouts of his body/soul (those form one entity, they aren't separated or Terra's body would be dead and rot away) and heart are a deliberate mystery. Terra's body was the "original" in the sense of that it was the starting point the split occured from, but that doesn't make the body suddenly a natural part of Xehanort. The restoration process takes the freed parts of an existence and puts them back together as they belong. Xehanort's body didn't rot away because Xehanort's soul is still in it, it is just placed in suspension. It was "only" Xehanort's heart that left. Without it the body can't function, but it doesn't get any lasting damage from it. Looking through the scripts of both Re: Coded and DDD though I realize the games yet again fail to make this clear in any form and I have again to resort to secondary sources to get the point across. When a Heartless is defeated, essentially, the owner of that heart returns to life somewhere in the Realm with the body that had once disappeared. Some facts about where hearts go were also established in KHII, but those were exceptional circumstances brought about by the Organisation. However, there is the rare case in which a body changes into a Nobody. If that has happened, without the vessel it ought to return to the heart will go into a suspended state. As can be seen the concept itself has been there already in 2007, but it was brought up in the actual main medium the games only in the secret ending of Re: Coded (when Yen Sid speaks about Master Xehanort returning, note how there they also already show old Xehanort and not Apprentice/Terra-Xehanort) and actually shown in action during DDD. What the games themselves however again failed to do was explain how it happened, hence why these questions tend to pop up again and again. Oh, and if you want to read the whole Director's Report, which our renowned member goldpanner took quite some effort to fully translate, here is the full version of it. My twelve selves would welcome me here on this day, when I would return a complete person. He says complete person, not Nobody or any conglomerate-mumbo-jumbo stuff, meaning he's the pure unaltered Xehanortâ„¢ with all the original parts. Doesn't get much more clear than this, and yet I still can understand people scratching their heads over such topics because all this information cannot be easily deciphered from the games themselves. Yep, Terra's fate is an enigma, but not by oversight or laziness, but by design. Thanks for the clarification, Seph. And yes, the game's narrative isn't very clear about a lot of aspects that are pretty much vital to how they're gonna tie loose ends in KH3. They should honestly refresh a lot of topics. Maybe the secret reports of KH3 will contain these topics? Yen Sid: "In the Sleeping Worlds, real time does not flow." Imagine how simpler things would be if Young Xehanort took the extra two seconds of monologuing to say he picked up Ansem and Xemnas in Traverse Town or wherever. Indeed, although in some cases it may also be intentional to produce a bigger impact when they finally reveal it, those fans who want to have at least a general grasp on the "how" are left hanging in the air and that can (and as we see does) hamper the enjoyment of the story as a whole. It may also lead to parts of the fandom becoming so convinced and reliant of their own interpretation of an ambigious situation that they are unable or refuse to accept when an actual canon revelation for this particular ambigious case is made. A good example is the whole issue with the fact that beings who are said to or implied to have no heart can somehow gain one. It has been implied and with vague and ambigious situations been teased ever since Chain of Memories but directly confirmed only in DDD, with those who either missed these implications and teases or choose to ignore them because of relying too much on the contrary propaganda spewed around especially blatantly primarily in KH 2 calling "retcon" or "bad writing" on DDD when in this case it was nothing of that but rather an ambigious situation being cleared up with a contrasting resolution to their own interpretations. Considering how fully packed KH III already is (and I'm personally not trusting Nomura to not squeeze in all the Chi-garbage on top as well) I'd say some entries in possible KH III reports is the most one may expect on these issues, and even then they won't address all of these. There is simply a whole mountain of stuff that could use attention because Nomura & co. made the error of constantly adding new mysteries and questions (X Back Cover is an example that is as blatant as it is unneccessary) before resolving a reasonable amount of those already present. It is a viable possibility indeed. It would be simpler, and that's exactly why it didn't happen like that. Alas: Simple + Nomura = doesn't compute! C.) He'll be used in the next saga after Xehanort's. But I am very convinced that the story after KH3 will certainly be heavy on the KHx lore. Yeah. There could have been simpler ways to bring back characters such as Ansem and Xemnas without the need of time traveling, even though KH's iteration of time travel is very limited.